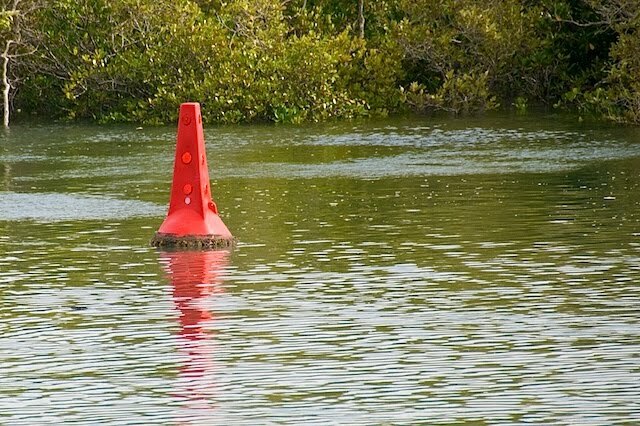 January always brings the highest tides of the year, and with it often some unexpected flotsam, but we didn't expect to see a new navigation marker outside the boat shed. Surely they don't expect us to go round that do they? We watched as it floated down the river, hovered on the change of tide and came to rest on the far bank. When I reported it, the Water Police person didn't at first seem to understand that I wasn't concerned about the buoy itself being a hazard, but the absence of the marker on the reef near the bridge had the potential to cause real harm to an innocent holiday maker. After some explanation, help was dispatched and it was returned to it's more useful location within the hour. I wonder how many times we've navigated waterways oblivious to unmarked dangers.